This photograph, that I have titled "Popping Papa," is one of my favorite wedding photographs from 2015. I captured this photograph in the bride's hotel room at the Residence Inn at LA Live in downtown Los Angeles. This is an excellent example of what photojournalism is all about in that what you see here is a decisive moment where many things came together perfectly. As a wedding photographer, part of our job is to anticipate moments before they happened to that we can capture them within our viewfinder and present them to our brides and grooms do their photographs. In this particular case, the level of difficulty involved in capturing the cork midflight perfectly positioned within the frame cannot be easily anticipated. 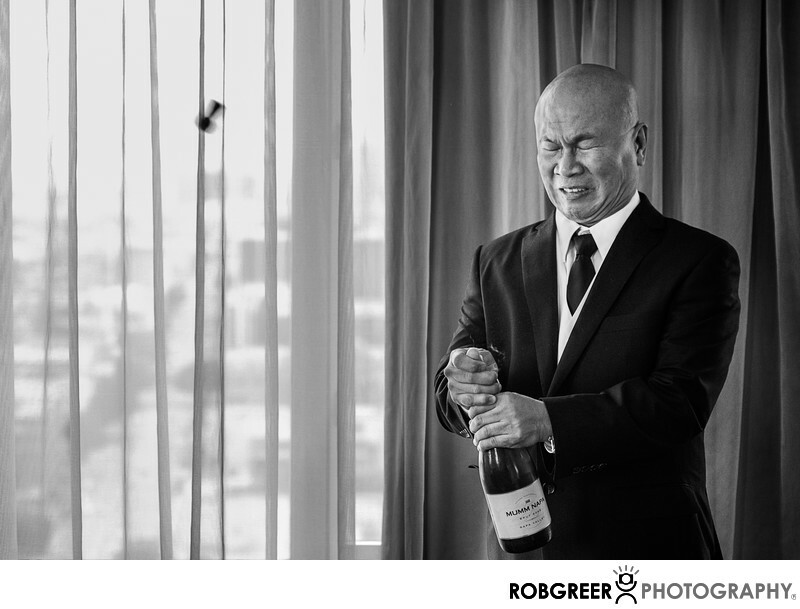 In addition to catching the cork midflight, as it flies from the neck of the champagne bottle, I was lucky in the expression seen here by the bride's father. If you look closely at this image, you will also see smoke rising from around the father's hands proving that this was a moment in time captured rather than one manufactured. At the 2015 WPPI Print, Album & Filmmaking Competition, this image was awarded with a Silver Distinction Award in the Photojournalism category. I actually had much higher hopes for this particular print as it has many of the elements necessary to score well in competition. For example there is story, there is a motion, and for photojournalism, there is a decisive moment. However, I can see why some judges might not awarded a higher score because it lacks significant impact. Certainly it will elicit a chuckle for many viewers, and it might even be highly memorable, but it is not a perfect image — and I'm always seeking that perfect image. Residence Inn at LA Live is located in Los Angeles, California. Location: 901 W. Olympic Blvd. LA 90015. Keywords: Residence Inn at LA Live (3). 1/125; f/4.5; ISO 1000; 70.0 mm.